With Dads Army having finished 3 years previously and It Ain't Half Hot Mum nearing it's end it was time for yet another Perry and Croft classic to be born. Jimmy and David both knew Butlins Holiday Camps very well. Jimmy had spent his holidays from RADA there as a redcoat, entertaining the campers, whilst David had produced the shows there for a number of years. Previous attempts had been made by other writers, but they had got it wrong. Jimmy and David knew that Billy Butlin gave his campers a jolly good time, and not make the campers feel like prisoners, which is how holiday camps had been portrayed before. 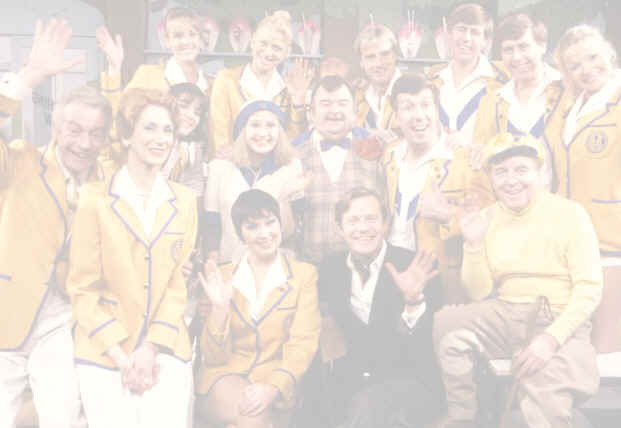 One of the main stars of Hi-De-Hi was Simon Cadell who was to play Entertainments Manager Jeffrey Fairbrother. Simon was to become a lifelong friend of David and Jimmy and went on to marry David's daughter Becky. Simon decided to leave after Series 5 and was replaced by David Griffin who played caddish Clive Dempster. The next main role to be filled was Ted Bovis, Camp Host. David fancied offering the role to Ronnie Hilton, but Jimmy saw club entertainer Paul Shane on Coronation Street. He fitted the role perfectly. They used Ruth Madoc as head Yellowcoat (and man-eater) Gladys Pugh. Jeffrey Holland was chosen for the role of Spike Dixon, Camp Comedian. Jeffrey had appeared in an episode of Dads Army, driving a lorry. Seasoned actor Leslie Dwyer was chosen as the chilld-hating Punch and Judy man. Diane Holland and Barry Howard were cast as the forever bickering Ballroom dancing champions, Yvonne and Barry, and Felix Bowness was cast as Fred Quilley, resident jockey. Richard Stone pleaded with Jimmy and David to see a girl who he thought had a lot of talent before they finished casting. She turned up at Jimmy's home breathless and bombarded them with her life story. She was dressed rather strangely in odd stockings. Her name? Su Pollard of course! They wrote the part of "potty" chalet maid Peggy, just for her. The theme tune this time was performed by Ken Barrie, more famous for Postman Pat. Paul Shane sung the closing theme from the second series onwards and done in a fifties-style rock and roll number. It was written by Jimmy on his own and released as a single in 1981. It made Number 36 on the charts, which proved how successful the programme was.